raised up their nets. Hallelujah the brick, the debris! I was given a city! The city got between me and God. tongue curves to make a word. meat. I loved the flesh. I was given bread only. I was given only water. I was given a cell with a window. There was a certain light at evening. I was given nothing but air, and the air dazzled. "All You Do Is Perceive operates mostly as a kind of constrained verse — not constrained formally, as the term is generally applied, but constrained by a rigorously limited perspective." Read the full review. 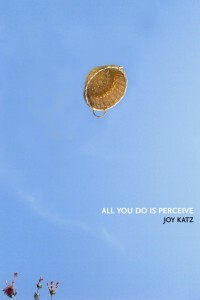 "Especially surrounded by this pulsing human noise, Katz’s third collection of poetry shows readers a loud, beautifully chaotic world rendered with astonishing precision." Read the full review.